It's the end of the season for rugby union so that means we're in for a treat in the form of the Quilter Cup clash between England and the mighty Barbarians at Twickenham Stadium. The game is due to kick-off on Sunday May 27 at 3pm BST, 10am ET, 7am PT, 12 midnight AEST. The end of season rugby finale is all set in the form of the Quilter Cup clash between England and the Barbarians. As always Twickenham is in for a dazzler of a display from the world class players involved. And if you're wondering where you can watch a live stream of he match, look no further. The England squad, as laid out by head coach Eddie Jones, has come under scrutiny after Wasps fly-half Danny Cipriani was named. The 30-year-old was last capped for England as a full-back in a 2015 warm-up match with France, and his inclusion back in the squad has been the major talking point in the build up. 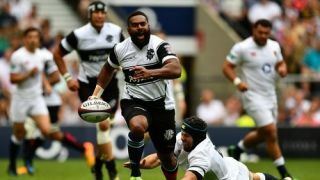 Pat Lam, head coach for the Baa-Baas has announced his squad with one of the most varied squads in the team's 118-year history with players from New Zealand, Ireland and Fiji to name a few. All eyes will be on World Cup winning Malakai Fekitoa and Scotland fly half Finn Russell. After losing the match last year 28-14, the Barbarians will be looking for a little bit of revenge. So with a strong line up on both sides this is set to be a riveting rugby battle royale. You can watch it all live, anywhere. Here's how to enjoy the game via a live stream using our handy guide. Sky Sports 2 has the rights to the England vs Barbarians rugby game and coverage starts from 2:30pm BST for that 3pm kick-off. That means you have two option in the UK. Either you pay a full Sky Sports subscription and watch the game or you can use NOW TV on a pay monthly, weekly or even daily basis to catch the action. Of course the third option is to find a pub that's showing the action, but then you can't watch it from the comfort of home – or on your phone from anywhere using the Sky Go app. As you might imagine, international interest in a UK-based Baa-Baas game isn't huge, and that means a limited choice for watching abroad. FloRugby claims to be airing the game online though, so that could be an option. The match starts at 10am ET, 7am PT. Alternatively, check out our handy VPN guide above to see how you can catch the action live online for wherever you are. Nothing better to to ad midnight on a school night? Subscription service FloRugby has the England vs Barbarians game in its live schedule. But again, you may prefer to use a VPN to login to an alternative nation's broadcast.